There is no record of the birth name of Sargon and what is known of his origins are little more than legends. What is certain is that his impact on the Ancient Near East would be felt for thousands of years and the empire he built would forever end the politics of the world where city-states had ruled. Sargon himself was following a tradition of earlier conquerors that had waged dynastic wars for countless centuries. However, whereas previous rulers had aspired for preeminence, Sargon aspired for actual conquest and real political power. Sargon was serving as a courtier of Ur-Zababa, the King of Kish when the King of Uruk, Lugalzagesi united the city-states of Sumer under his control. It is likely that at this time Sargon withdrew to his own estate somewhere in the region of Iraq where the Tigris and Euphrates rivers come closest together. He is known to have built the city of Akkad, which is pronounced Agade in the Sumerian language. The name means “Ancestral City” and its exact location remains a mystery. It is commonly believed to have been located in the region of Kish and Babylon. Later, after Sargon’s reign, the land to the north of Sumer was also designated as Akkad, even after the city had faded from history. After securing his base of operations Sargon waged a successful war against Lugalzagesi. 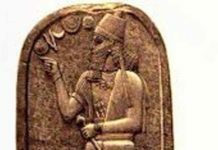 The King of Akkad, Sargon, brought the King of Uruk as a captive to the city of Nippur where he presented him in the temple of the chief god, Enlil. Sargon then launched campaigns against the cities of Ur, Umma, and Lagash. Sargon was not content with mere submission from the conquered, after conquering the major city-states of Sumer he also tore down there walls to prevent further resistance. Following the conquest of Lagash Sargon went to its port, Eninkimar, and conducted a ritual cleansing of his weapon in the water of the Lower Sea/Persian Gulf. The cleansing was meant to show the firm control that Sargon had established here at Sumer’s gateway to the rich overseas markets in India, Arabia and Africa. In a clear effort to establish a unified state Sargon placed family members and citizens of Akkad as governors throughout the conquered territory. Sargon also installed his daughter, Enheduanna, in the city of Ur as high priestess of the moon-god Nanna. As high priestess she would have wielded considerable political power in the ancient city. Enheduanna is remembered in history as one of the world’s first known poets and several hymns she is credited with having written survive to this day. With his base in Sumer and Akkad secure Sargon marched to the east and conquered Elam. Here he was following in the footsteps of Lugalanamundu, the king of Adab, who had conquered Elam over one hundred years earlier. However, unlike his predecessor Sargon was then able to leave Elam under the control of his lieutenants and continue his conquests. Sargon marched his army up the Euphrates to the west to subdue the trading emporium of Mari. The city of Mari was sacked during this period and evidence points to the Akkadians; who apparently refused to have their control of the upper Euphrates contested. Sargon also secured a treaty with Ebla in central Syria which acknowledged the Akkadian king as overlord. With central Syria under his control Sargon set out to secure the Amanus Mountains of Lebanon which were a primary source of cedar for the entire Near East. After establishing control in Syria Sargon moved northward and took control of the trade routes leading to the Taurus Mountains which contained valuable reserves of Silver. It is possible that Sargon pushed further northward into Anatolia and some later legends even credit him with visiting the island of Cyprus. Sargon was lucky enough to follow up his extraordinary conquests with a long reign of fifty-five years. During this time he faced rebellions from some of the conquered territories but each time he put down the resistance with brutal efficiency. The city of Akkad became the center of a vast trading empire and for over one hundred years Sargon’s Dynasty of Akkad would rule as supreme.